Vita shoot 'em up lands on Sony's current PlayStation ahead of its sequel's PS4 and Vita launch next year. Sci-fi shooter Velocity Ultra will make its way onto the PlayStation 3 before the end of the year, according to a post on the PlayStation Blog. The game, released earlier this year on PlayStation Vita by FuturLab, will feature HD graphics, trophies and leaderboards. Velocity Ultra will not use the PlayStation Network's Cross Buy or Cross Save features, which would allow players to purchase both the PS Vita and PS3 version of the game for the same price and transfer saves between them. Trophies can be shared between the two versions. One of the game's developers, James Marsden, commented in the PlayStation Blog's post that the main reason these features could not be implemented is due to the PS3 version being published and developed by a different studio, Curve Digital. Since many gamers received Velocity Ultra for free via the PlayStation Plus service, it wouldn't make sense to have another publisher release a version that would be given away for free. As for the Cross Save ability, both Curve and FuturLab are too small as studios to make a complicated system like that work, Marsden said. 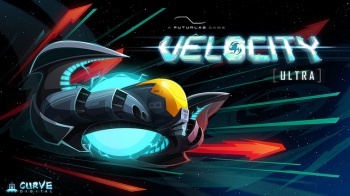 Velocity Ultra is itself a remake of FuturLab's 2012 release Velocity, a part of the PlayStation Minis program. Also in development is sequel Velocity 2X, which is scheduled for a 2014 launch on the PS Vita and PS4. Marsden said that Velocity 2X will feature a Cross Buy and Cross Save feature for the PS4 and Vita.